The conference organisers want to thank you all for your interest towards our event. If you have any questions regarding the registration, please contact the conference team at futuresconference(a)utu.fi. The European Journal of Futures Research provides 20 hard copies of the most recent journal to the first 20 individuals who sign up for the conference. Read more. Participants should make their hotel reservations directly to the hotel of their choice. Information about the hotels. registration to include conference meals (not dinner). – Lectures, sessions, panels and conference materials. – Pre-conference seminar on M/S Viking Grace (see further instructions and registration). – Morning and afternoon coffees/teas and lunches on both conference days. – All participants receive a hard copy of the book: Heinonen, Sirkka & Ruotsalainen, Juho (2014) Toward Ubiquitous Learning 2050. 2050 visions of the futures of education, work and technology. AEL, Helsinki. The conference fee does not include the conference dinner on 11 June. This is an additional cost of 50 euros and it can be purchased when you register for the conference. All payments are made in advance in euros (EUR) when registering online. You will receive instant confirmation of successful registration to your email. – Credit card (via Paytrail): Visa, Visa Electron, MasterCard and Eurocard are accepted. Registration and payments are handled by the University of Turku. Please note that your registration will only be valid when you have paid your fee in full and it has been received by the University. Payment for the Pre-conference aboard Viking Grace to be made separately – please follow this link. 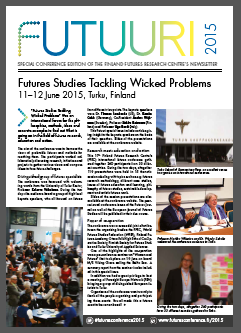 Cancellation must be made via email to futuresconference(a)utu.fi 1 June 2015 at the latest. No fees will be refunded after that date. A processing fee of EUR 30 will be deducted from all refunds. Registrations can be transferred to another participant at no cost by notifying the organisers. All transfer requests must be sent via email to futuresconference(a)utu.fi.